Another wonderful year at Brabyns is nearly complete. It never ceases to amaze me how much is achieved by everyone in the Brabyns family each year, be that our children who have been here for a long time, or the newest members who have joined us at the start of, or during, the year. I hope whatever role you have, you feel that way too and are aware of all the amazing things that happen here on a day-to-day basis. It is the day-to-day lessons and activities make Brabyns so special, coupled with the wonderful ‘big’ events that we run throughout the year. 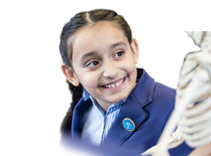 The individual care and attention of the children along with their engagement and achievements in everyday and bigger activities and lessons is fantastic to witness. I regularly see how every child in the Brabyns family has benefitted tremendously from the personalised nurturing support they receive during the year, whilst enjoying so many opportunities. Our nurturing ethos is at the core of all we do and this is demonstrated excellently by our Year 5 and Reception buddies. Both classes gain so much from this partnership and it is a joy to see the way the Brabyns family works and how all of the children, whatever their age, interact together and care for each other. In terms of the engaging activities around School, trips continue to benefit and supplement the children’s education and development. These weekly occurrences are an integral part of the children’s education, providing lasting memories to support their work and reflect upon in general. To give just a couple examples, we took Year 3 & 4 on the train to London (what an amazing experience) to visit the Houses of Parliament and for a Thames boat trip, while we introduced Bikeability for the Year 5 and 6 children to provide them with an essential life skill of being safe on the roads on their bikes. Our sports and performing arts calendars have continued to offer a varied range of activities for all the children. It is a pleasure to see children playing and performing confidently to such a high standard, and having the opportunity to represent the School. For those who saw the School Play this year at New Mills, I’m sure you’ll agree how wonderful every child was, particularly those who find performing out of their ‘comfort zone’. Alongside our core lessons and trips, our engaging residential programme works fantastically and I know is one replicated by many other Schools. The Year 1 children enjoyed their first Sleepover with their friends in Year 2. Year 3 and 4 had an amazing time at Lockerbrook with some fantastic individual achievements—and every child abseiling off a 75 foot bridge! Meanwhile the Year 5 and 6 children took part in a variety of outdoor adventurous activities at Caythorpe! These were supplemented by the Junior Ski Trip to France, which was a truly amazing experience for all involved. Lots of these activities go towards our ‘101 Things to Achieve Before Leaving Brabyns’, in its second year now. I am pleased that we have more children who have achieved the badges at the various stages, including the ‘exclusive Blue 101 Badge’. Our Year 6 children leave us having had a wonderful start to their lives and education, some having been with us for 9 years! I know they will take with them so many happy memories and the foundation to be able to have a successful, enjoyable and fulfilling future: and possibly most importantly with the confidence to know they can do anything! They have all worked to the best of their capabilities, with some sitting (and passing) for independent school exams and others choosing to move on to local Senior Schools. A great work ethic is something we aim to instill in every child and all have many wonderful achievements. If everyone does that, in my eyes they are all a big success. We’ve hopefully given them the foundations to do what they want in life and overcome the various challenges that they’ll come across. Talking to previous leavers, many have reported back that our work at Brabyns has helped them achieve something after they’d left us. Year 6 will always be members of the Brabyns family and are welcome back to see us any time. 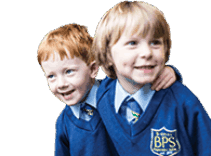 They are great role models for our Nursery and Reception children and it is reassuring to know that the younger members of the Brabyns family can aspire to be like their elders as they progress through the School. 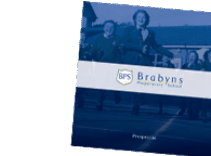 I regularly tell the children that Brabyns is their School and I want to ensure they have the opportunity to mould it in the way that fits them and their needs. It was great that the numerous visitors to the School during the year, like the Inspectors last year, concur with this sentiment and often look at what we do with envy. Many a parent I show round says they wish their School was like this when they were a child. The children are definitely an integral part to its success. We as a staff and parents are here to provide the opportunities we can, but it is up to the children to grasp them and make the best of them, both in and out of the classroom. We have continued to meet many aspects of our School Development plan to further enhance everyone’s experience in School. We look forward to having a new plan in the new year, which will continue to focus on our core aims of nurture, engage and achieve and we will be asking for parent input in due course. Brabyns is a wonderful place to be a child, to work, and hopefully, you feel, to be a parent. We can all be rightly proud of our input into making it such a special place, and it really is a privilege to witness it everyday. I thank you for your continued support, and as always a great big thank you to the children and staff, who are wonderful and frequently go above and beyond and put the interest of the children in the Brabyns family first.